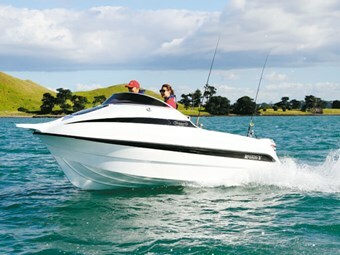 With the current sky-high fuel prices, enjoying time out on the water can be an expensive exercise. But catching a feed in comfort and style needn't cost the earth. Matthew Jones gets a first look at the Regency Monaco 480 Limited Edition. Regency Boats is a fresh new manufacturer with a fuel-efficient hull design boasting cost-effective comfort, smart looks and an electric toilet in a 4.8m fibreglass boat. Managing director Shane Vickery explains the concept behind the design: "The design brief was that it had to feature a fishable cockpit, nice high sides for safety, an electric flush toilet (which we were told couldn't be done in a 4.8m boat), have low horsepower requirements, be economical to run and also easy to handle on your own. We've achieved all that we've set out to do and then some," he adds. Vickery has had a love affair with boating for as long as he can remember: "I just love boats. If I don't have a boat I feel like a businessman going to a meeting without any shoes on," he says. While still in high school, and without a boat in the family at the time, Vickery juggled homework and a couple of part time jobs, saving every penny to purchase a 28-foot Carl Augustin launch, much to the bewilderment of his friends and family. Fast forward a few decades and while Vickery’s current launch is a huge step up from his first vessel, he still has fond memories of his first love. While doing a refit on Vickery's current boat, friend and long time boatbuilder/designer Tom Tulloch happened to mention a neat little fuel-efficient design that he wanted to get to market, but lacked the resources to do so. They decided to join forces, with Tulloch bringing the design skills and Vickery bringing the business acumen and financial resources to get the idea off the ground. After a year and a half perfecting the design, they're now going into full-swing production, having secured the services of Black Pearl Fibreglass to contract build to a high standard. Regency won't be selling through a dealer network, though, instead opting to market the company’s range online to cut out the middle man and keep the price down. 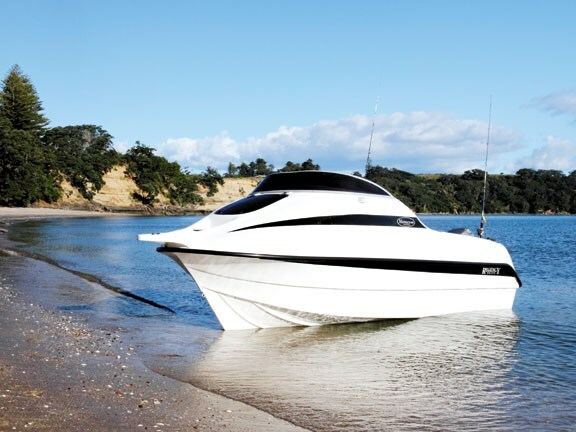 The current line-up (including 4.8m, 5.8m, and 7m models) will be displayed in a showroom in Karaka, Auckland, with demonstrators available on-site for sea trials. There are plans to offer a Fisher (more basic) model in the future, but Vickery would rather see his customers go boating in style with the Limited package, having priced it attractively. Regency Boats is also happy to add any additional bling that's required and can custom build for clients. "I'd absolutely enjoy doing a custom build for someone," adds Vickery. Fitting the outboard of your choice is no problem either, although Vickery feels the Mercury range will suit most buyers. The Regency 480 Limited Edition has been specifically set up as a day boat, with entry-level family buyers and retired gents in mind who are looking for a comfortable and affordable new boat. The star attraction is the electric flush toilet which, for privacy reasons, has been neatly hidden behind a bulkhead in the front cabin. Good headroom has also been afforded, so there’s no need to sit with your head between your legs either. Further privacy is available through the addition of a zip or dome up canvas cabin door cover. Seating for three has been provided in the fully-lined cabin with a recessed compartment providing gear storage and additional legroom. Sealed buoyancy chambers are hidden beneath. A moulded non-skid step and good sized hatch has been provided for easy anchoring, or make that effortless anchoring, with provision for an optional automatic capstan. The cockpit floor is fibreglass with a moulded non-skid pattern, providing good grip and an easy-clean option. Carpet can also be added for greater comfort. Twin underfloor bins are available and look spacious enough to take a dive tank in each. Our test boat was fitted with twin tote tanks but an underfloor tank is also an option, sacrificing an underfloor bin but freeing up storage space in the transom cupboards. A handy dry storage compartment and the bilge well are neatly concealed behind the centre compartments. Pedestal helm seats afford storage below and are comfortably finished, although they're of the fold-down variety and would benefit from some locking catches for safety when leant on. They swivel to face the rear allowing for a rather relaxing fishing position with footrests included. 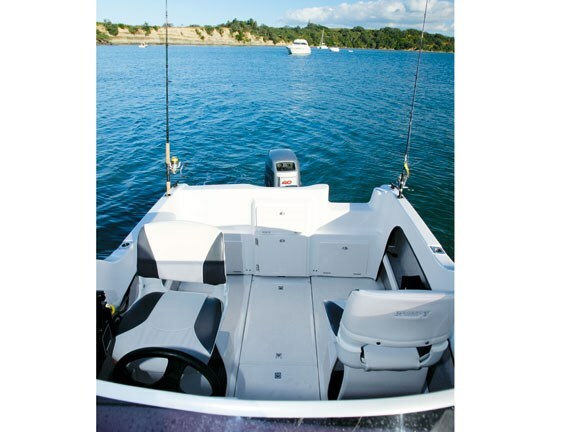 Rear transom seats can also be added to increase the seating capacity. There's a good amount of real estate available on the dash to fit a full set of gauges, which should also leave enough room for a five-inch screen. 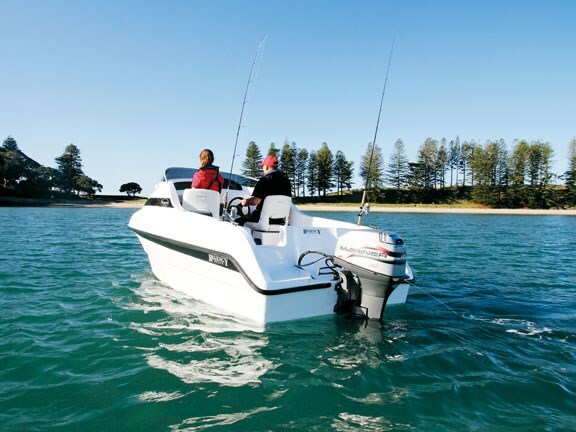 A VHF and stereo are included on the options list to increase both the safety and enjoyment factor. The low windscreen doesn't offer a lot of protection and, even when seated, most people will be looking over the top, but this posed no issue given the good conditions on the test day. Gunnel width has been kept to a minimum to allow for a roomier cockpit and two of us flicked soft-baits around without stepping on each other’s toes. Four stainless steel rod holders are supplied as standard and a bait board can be optioned in to increase the fishability rating. Part of the design brief was to have high sides to keep the family safe and they definitely fit the bill at between 800-850mm high off the floor. The step-through transom is also quite shallow and positioned high up for extra security. It was a stunning autumn afternoon when Trade A Boat met up with Regency Boats on Auckland’s Hauraki Gulf to get a first look at the Regency Monaco 480 Limited Edition. Upon reaching our pre-arranged rendezvous point, her sleek lines, glowing white exterior and contrasting black stripes certainly made her stand out from the crowd. Vickery had fitted the lowest and cheapest horsepower option to demonstrate that the almost 5m-long fibreglass boat can be easily driven by only 40hp. And, thanks to its efficient hull design and overall light weight, it certainly can, reaching a top speed on the day of 25 knots at 6000rpm (WOT). Backing off to 5000rpm saw 17 knots but unfortunately, with no electronics fitted (and my so-called smartphone not living up to it's name), no further performance figures were able to be recorded. With two people on board, transition onto the plane was barely noticeable and acceleration was better than expected given the small engine size. While a top speed of 25 knots certainly won’t suit everyone, an upgrade to the maximum 75hp two-stroke Mercury option will still only set you back $29,900, including a DMW Premier Series trailer. Conditions on the test day were extremely pleasant (which was a nice change) but didn't provide much of a testing ground. The fairly plumb bow cut through what little chop and wake we generated easily, although the outboard height meant I couldn't throw her around too much before the prop lost all grip. Vickery tells me that he's had this boat out on a rougher day and was impressed at how dry it was, even without a bimini cover fitted, but I can't vouch for this personally. As our test boat was the first one out of the mould and was literally finished on the test day, there were a couple of set-up and finishing issues that Regency Boats was aware of beforehand. These are currently being rectified, namely rattling transom hatches, a couple of loose screws and a too-high outboard height, which will hopefully already be sorted by the time this goes to print. The Regency Monaco 480 Limited Edition certainly represents a lot of boat for its price tag. The electric toilet combined with its alluring looks should impress the significant other, and finding a crew for fishing adventures won't be hard either given the likely fuel bill, although you may need to start a waiting list once your mates find out how thrifty this hull actually is.